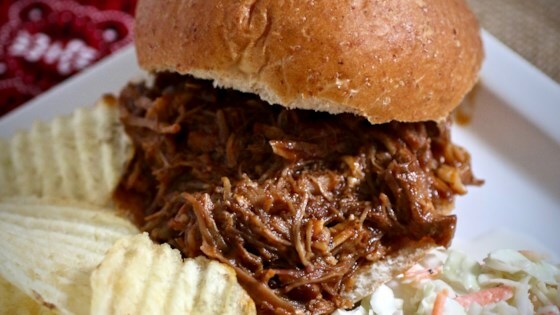 "Try the most delicious, melt-in-your-mouth pulled pork sandwiches, made easily and without hassle in your Instant Pot®--an absolute family favorite!" Whisk smoked paprika, brown sugar, garlic powder, salt, and black pepper together in a large glass or ceramic bowl. Add pork and toss to evenly coat. Cover the bowl with plastic wrap and marinate in the refrigerator for 30 minutes. Turn on a multi-functional pressure cooker (such as Instant Pot(R)) and select Saute function. Heat oil and cook pork in batches until browned, 5 to 7 minutes. Pour in barbeque sauce and water. Close and lock the lid; select Manual function and set timer for 60 minutes. Allow 10 to 15 minutes for pressure to build. Release pressure using the natural-release method according to manufacturer's instructions, 10 to 40 minutes. Unlock and remove lid; transfer pork to a separate plate. Reselect Saute function and simmer sauce until thickened, about 10 minutes. Shred pork with 2 two forks; mix with sauce. Slice bread rolls in half and fill with pulled pork; cover with tops. See how to make an incredibly easy pulled pork recipe in your slow cooker. Made the recipe as stated except cooked the meat under high pressure for 45 minutes instead of 60. The meat was very tender. This recipe makes too much liquid. Used apple cider vinegar instead of water, used standard 3 lbs pork shoulder roast and cut the fat before cooking. Tasted better than usual. I cut back on Paprika and water, substituted the water for Apple cider vinegar as a few reviews said. I added Garlic Salt 1tsp to the ingredients as they were left out of the list. It's good. Very tasty. My whole family enjoyed it. I added two tablespoons of brown sugar but that was all I changed. Will definitely make this again!! First time using the Instant Pot for pulled pork and it came out Fabulous! The pork was juicy and tender! Will make again!